Yamaha A-S3000 review | What Hi-Fi? If you’re a reader of this website, we imagine the Yamaha brand makes you think of home cinema amplifiers and soundbars. The company, of course, makes a massive range of products - including a selection of motorbikes and the odd grand piano. 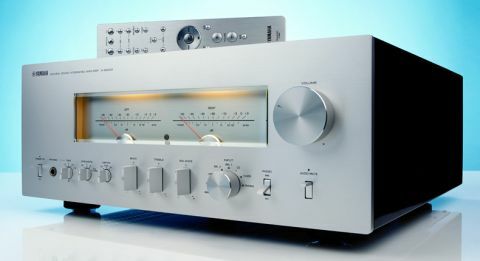 We’d be surprised if too many people connected Yamaha with high-end hi-fi; it’s not that it doesn’t have pedigree in this area, it’s just that its concentration has always been elsewhere. But the A-S3000 amplifier, with the partnering CD/SACD player (the CD-S3000), is an effort to revise that impression. We’re impressed the moment we unpack this unit. The A-S3000 is a beast of an integrated, weighing in at a hefty 25kg and taking up as much space as a baby hippo. It’s beautifully built too. The casework is rock-solid, and the fit and finish is second to none. We love the way the switches and controls feel: there’s a crispness and precision to their operation that makes them a joy to use. The remote control handset is almost as nice: it’s simple, well designed and feels like a luxury item. We admit to having something of a soft spot for the amplifier’s front-panel power meters too – it’s a bit of a nerd thing. The overall visual effect is distinctly retro and none the worse for it. The A-S3000 uses an elaborate case-within-a-case structure to reduce the amount of vibration that reaches its sensitive circuit boards. There’s been a strong effort to minimise signal path lengths too, with a view to reducing the amount of distortion the music signal picks up on its route through the amp. This Yamaha is generously equipped as far as the high-end is concerned. Not only has the company included six line-level inputs, but a switchable moving magnet/moving coil phono stage too – unusual in a high-end integrated. The phono stage built into the A-S3000 is a decent one. It’s relatively quiet and had more than enough gain to work well with our reference Clearaudio Stradivari V2 moving coil (output of 0.6mV). We would have liked some adjustment for cartridge loading to optimise the cartridge’s performance though. Still, it’s nice to be able to swap between magnet and coil settings via a front-panel switch. Tone controls aren’t something we talk about a lot, but the ones fitted to the A-S3000 are well designed. Keep them on the zero setting and the tone circuitry is bypassed totally, preserving the integrity of the signal. Use them and the drop in performance is subtle. They can be useful: if you’re listening to a recording that’s a bit edgy tonally, say. The Yamaha’s power output of 100 watts per channel isn’t particularly outstanding, but we found it ample with a whole host of speakers. After a few days of running in we admire aspects of this Yamaha’s performance too. We start off with a record player as source, in this case our reference Clearaudio Innovation Wood package. The results are pretty good. As is often the case we notice the tonal balance first. We’re used to Yamaha’s products sounding smooth and rich, and are surprised to find this amplifier doesn’t conform. It’s forceful in the treble and has real bite when required, yet it stays on the right side of acceptability. At the other end of the scale the bass sounds full-bodied and tautly controlled. The balance between the treble and bass is nicely judged too. There’s a good level of finesse, particularly through the midrange where Mary J Blige’s voice on No Drama comes through with all the passion intact, but the presentation seems just a little veiled, and lacks the kind of rhythmic drive and large-scale dynamics necessary to truly grip our attention. Switching source to our Naim NDS/555ps streamer improves the Yamaha’s performance in some areas and confirms our criticisms in others. The A-S3000 is certainly more insightful through its line-level stages, and the sound is notably clearer and more informative. Its terrific level of detail means that it has no trouble capturing the harmonic richness of a complex instrument like a piano (on Satie’s Gymnopedie No.1) or the rasp of Miles Davis’s trumpet. We’re still not totally convinced by the rhythmic aspect of this amplifier’s performance or its ability to deliver a truly visceral experience. Listen to the Jaws OST by John Williams and it’s obvious the Yamaha has no trouble delivering a lot of information. What it doesn’t do quite as well is communicate the savage nature of the music, thereby reducing the level of excitement. We play a host of recordings from Ólafur Arnalds’ hauntingly beautiful Found Songs to Bob Marley’s Exodus and our opinion of the Yamaha’s performance holds true. There’s plenty of detail here, plus precision and agility that we don’t normally associate with the brand. But there are also shortfalls in excitement and organisation that leave us wanting more. We take a listen to the headphone output with a pair of Grado RS1s and AKG’s K812 and decide it’s a decent effort. True, it lacks the sheer clarity of the speaker outputs, but there’s still enough insight here to please. All things being equal, an integrated solution would win (for us) every time. But all things aren’t equal, and while the A-S3000 has obvious talent, it’s not the fully rounded performer we hoped for.